Some days are a challenge. Some weeks. Some months. You know, those times when the days are long with small moments of challenge littered throughout the day. Like the past week here at tiny & little. Like when the oven began misbehaving. For this mama who bakes bread and the sweet treat for lunchboxes along with multiple meals each autumn/winter night and had plans for new recipes to photograph for the blog, it was disappointing. But to make matters worse it stopped working properly at all… two days before Mr Tiny’s birthday. Which I found out the hard way as I baked cupcakes for his class that erupted as the oven overheated. I turned the oven down and tried again only to have them erupt a second time. I slept on it and decided to try the cake, which failed. Another batch of cupcakes followed the cake into the bin. It was the day before his birthday and I realised that I wouldn’t be baking the football cake I had planned for him. Or the cupcakes. Or the homemade sausage rolls. Or the cookies. Or my dinner for that evening. Then Littlest grabbed his doctor’s kit and asked where it hurt so he could help me feel better. Mr Little stood tall because he’s the big boy of the house and asked what he could do to help. Mr Tiny said it was okay, we could just make fairy bread with a loaf from the bakery and he would be happy. It was touching beyond words and it was one of those small moments that reminded me of how our children observe and learn. They watch how we deal with challenging situations – I’m naturally the coping, “it will be okay, let’s get to work sorting out what we can do” type – and they bring them own personality to it. They were so sweet I fought back the tears. It was one of those moments I wanted to write down for my “love notes” jar. If the image above looks familiar because you’re a long-time tiny & little reader, firstly thank you for reading for so long! It was published in the very first issue of tiny & little magazine now two years ago with a reminder of the importance of taking a moment to remember the small moments and the little things, and placing them somewhere safe because you never know when you’ll need them. The things the little ones did that made you smile, the things they said that made you laugh. 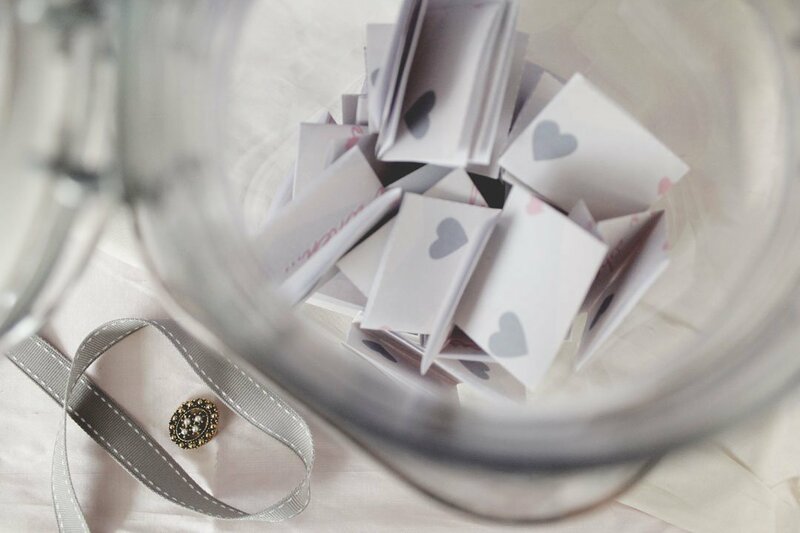 It truly is as simple as writing down on a scrap piece of paper something that made you smile or laugh and popping it inside to keep some hope and joy in a jar that you can take out to read when you need a pick-me-up. As I reach for my pen and paper to add a new addition to the jar, it is as treasured now as it was then. Do you keep a record of things your little ones did that brightened up your day for a darker moment? If you do, what happy moment have you added lately? Oh what a sweet little person. Great idea to save the precious things they say. I can’t tell you how many times I’ve thought I must remember those words – only to forget them minutes later.